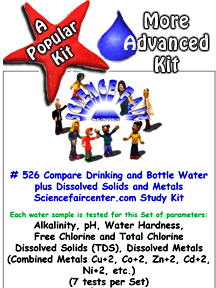 Compare Drinking and Bottle Water plus Dissolved Solids and Metals. Compare different brands of bottled water and drinking water from faucets. 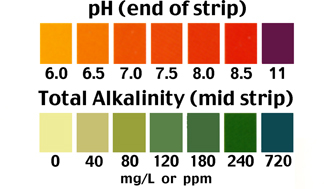 More advanced experiment for science fair project that combines chemical testing in both mg/L (or ppm) and microgm/L (or ppb). Students love learning about environmental impacts of bottled water. Testing only takes a few minutes per sample. 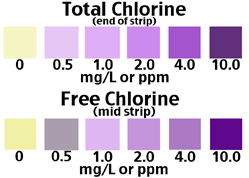 Each bottled and drinking water sample is tested for this Set of parameters: Alkalinity, pH, Water Hardness, Free Chlorine and Total Chlorine, Total Dissolved Solids (TDS) and Dissolved Metals (Combined Metals Cu+2, Co+2, Zn+2, Cd+2, Ni+2, etc. ), (7 tests per Set).